Johns Spirit fought bravely to deny the fast-finishing Colour Squadron and record a three quarter length victory in the Paddy Power Gold Cup at Cheltenham this afternoon. The 7/1 second-favourite was left in front following the fall of Easter Meteor two fences from home and started to wander around on the run-in following a decent leap at the final flight but jockey Richie McLernon managed to keep his cool and gather his mount up for one final effort as Colour Squadron rallied in the closing stages. Trainer Jonjo O'Neill was quick to praise his jockey following the race. 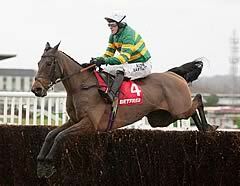 'It's brilliant for Richie ' he's a top jockey, a great horseman and a good man to have about the yard,' said O'Neill. 'This is a special race and it's great to have a runner, let alone win the race. I wasn't sure if he'd hang on after he jumped the last as he's just got a bit lonely. 'We were hopeful before the race but you can't be totally sure as we didn't know how he'd handle the traffic with his style of running. However, everything went to plan. 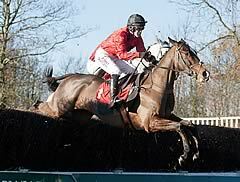 He jumped well and travelled nicely throughout the race. Richie did the right thing by taking a pull at the top of the hill but the horse does lose concentration sometimes when he hits the front. 'I'm not sure whether he got the trip or not because he was idling. I'm talking off the top of my head, and we'll have to see how he is, but he could come back here in December for the big handicap (the December Gold Cup). McLernon was delighted following the race and revealed that O'Neill was happy to let him ride his own race. 'I am lucky that I ride for Mr O'Neill, who always fills me with confidence. He lets me do whatever I want. 'I went wider than ideal ' I thought that they would give us a bit of fresh ground today but they didn't and the fences are narrow enough. If I went down the inner, I would have only have got blocked in, so I went wide and thank God he won. Connections of the Philip Hobbs'-trained Colour Squadron felt that Easter Meteor's fall at the second-last fence may have affected their chances of victory. 'It certainly cost me momentum and we were only beaten a neck,' said Colour Squadron's jockey Tom O'Brien. Bottom-weight Attaglance, trained by Malcolm Jefferson, stayed on from some way back to take fourth on the run to the line. The seven-year-old, who was 6lb out of the handicap, may try three miles again next time out. Jefferson said: 'He ran a nice race ' the ground was a bit softer than he really likes. He just got tapped for toe but he stayed on again. 'He is very ground dependent so it is difficult to make plans. This ground was a bit dead. He is a very tough little horse and three miles may suit him now. Champion Court, the 6/1 favourite, raced prominently in third or fourth but could not find any extra turning in and finished seventh. His trainer Martin Keighley said: 'It was a disappointing performance ' he did not travel the way he normally travels in a race. 'He has jumped well but normally on his first run he is very keen but he wasn't today. We will check him over but he just ran a bit flat which he shouldn't have done. Ballynagour, the 8/1 chance trained by David Pipe, was pulled up by Tom Scudamore.